This EKG comes courtesy of Dr. Khodorkovsky. An 88 y/o male with a history of CHF presents after a syncopal episode. He is currently awake and alert with a normal mental status. Vital signs are: Pulse – 30, Respirations 16, BP 110/70. The patient is hemodynamically stable. Atropine can be attempted. Pacing pads should be placed and the patient should be monitored closely. The EKG shows a bradycardic rhythm with absent P waves, a regular rhythm, with wide QRS complexes and a rate slightly less than 30. This is consistent with a ventricular escape rhythm. When the SA node fails, the heart has two back-up systems that can temporarily maintain a heart beat. One is the AV node (also known as the junction) which can produce a junctional escape rhythm. Another is the ventricles which can produce a ventricular escape rhythm (also known as an idioventricular rhythm). Both rhythms present with absent P waves and a regular rhythm. A junctional escape rhythm produces narrow QRS complexes at a rate of 45-60. A ventricular escape rhythm produces wide QRS complexes at a rate of 30-45. Treatment of a ventricular escape rhythm depends on the patient’s stability. If the patient is asymptomatic and stable, no emergent treatment is needed. Pacing pads should be placed on the chest in case the patient deteriorates. If the patient is symptomatic or unstable, they should be treated. Atropine is the first line treatment but it may not be successful. 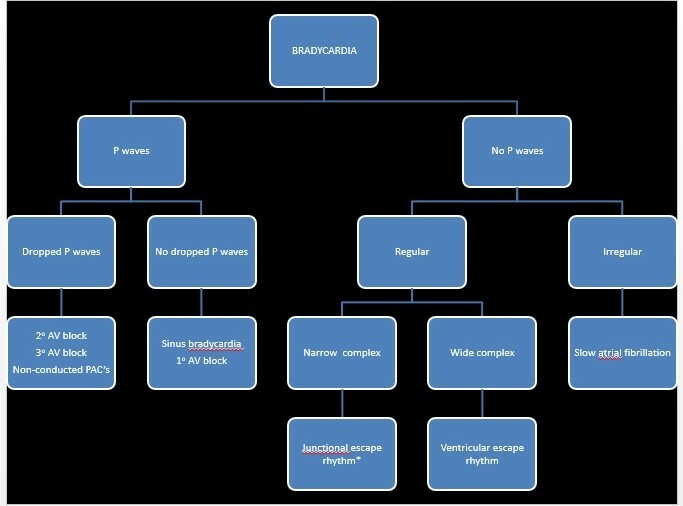 If it is unsuccessful, the patient should be paced (transcutaneous initially followed by transvenous). This patient was stable so pacing pads were placed and he was monitored. He was admitted to a monitored setting and had a permanent pacemaker placed.